High-end mechanical watch sales have grown again since the second half of 2017, driven by strong demand in Asia and from affluent Millennials. 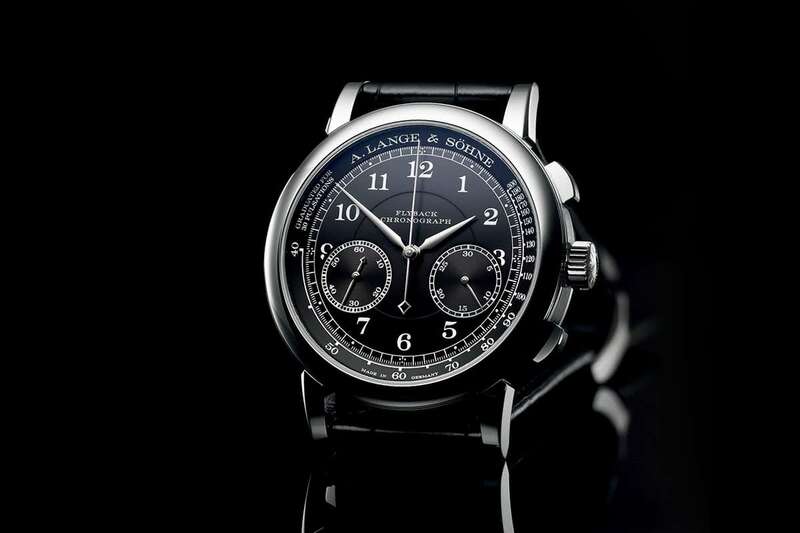 Traditional luxury watch manufacturers are challenged by new digital-first analog watch brands and smartwatch companies. Sales of Swiss quartz watches are collapsing as a result, with a 24 percent decline over the past five years. Millennials seek simplicity, personalisation and transparency when buying a high-end mechanical watch. 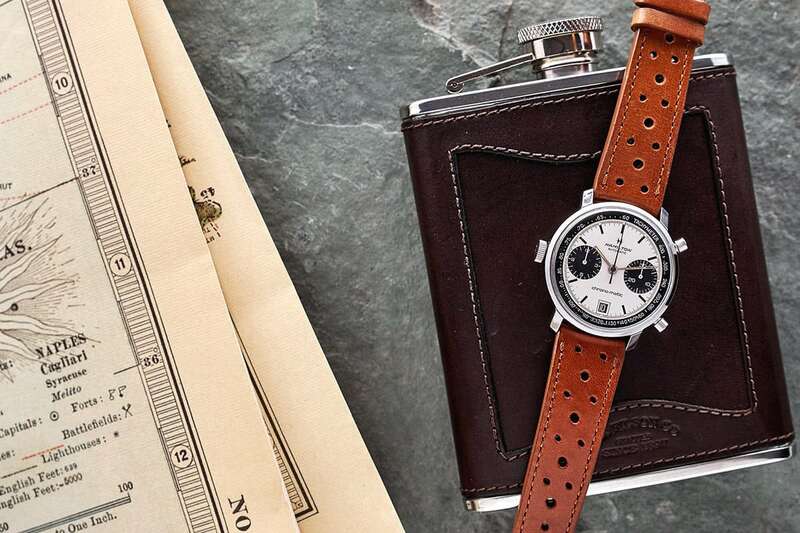 Traditional luxury watch manufacturers need to focus on vintage-inspired design and on developing their digital sales and marketing capabilities. 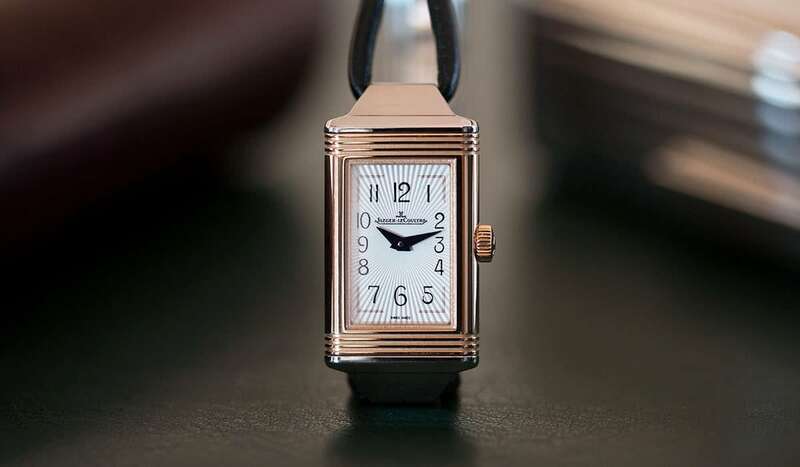 Luxury analog watches are making a comeback. Paving the way for the high-end mechanical watch resurrection are none others than the Millennials. However, luxury timepiece manufacturers need to be aware that the younger generation of watch buyers are not on the market for “old school luxury”. Instead, affluent Millennials seek simplicity, personalisation and transparency when choosing their luxury timepiece. As a result, high-end mechanical watch manufacturers are focusing on new product launches and developing digital sales and marketing channels to grow. Vintage-inspired designs and online collaborations with influencers and bloggers are particularly important. 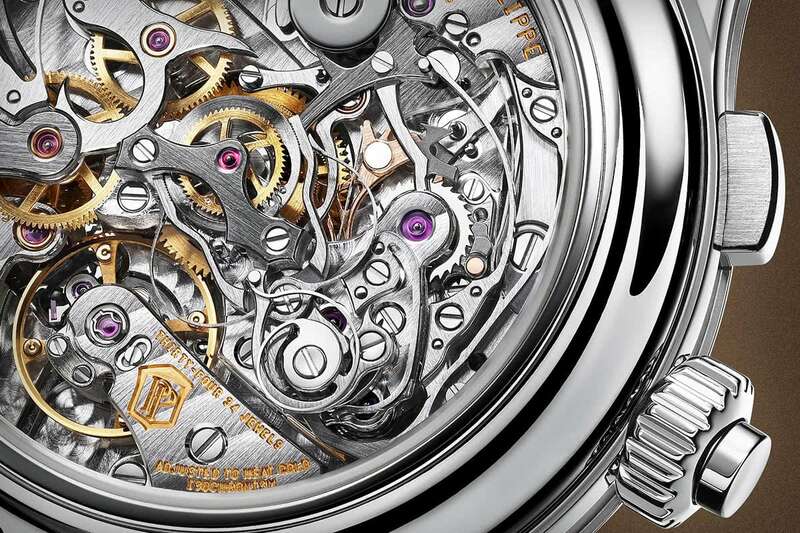 High-end mechanical watches are as relevant today as they were before. However, luxury watch marketers need to be aware of the generational shift towards modern luxury. This article explores the definition of modern luxury, with a particular focus on the meaning of the word for Millennial consumers, and how prestigious analog watch brands can leverage digital to appeal to a new and savvy generation of modern luxury consumers. A recent survey from Deloitte found that Millennials remain highly attracted to high-end Swiss watch brands. 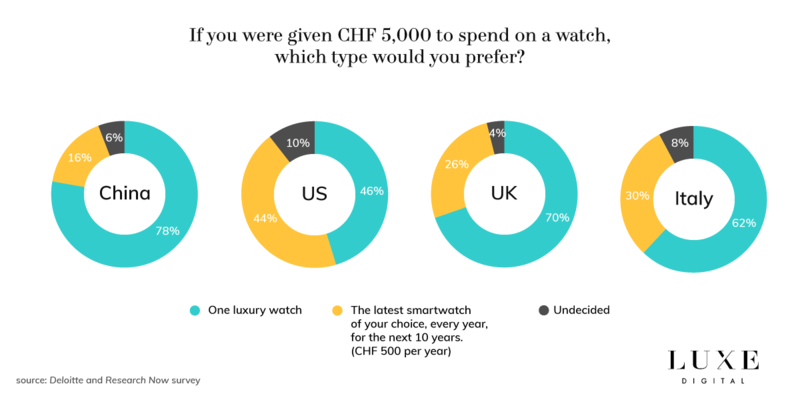 The research shows that Millennials would indeed favour an analog luxury timepiece over a digital smartwatch if given CHF 5,000 (USD $5,135) to spend on a gift watch. A significant majority of Millennials surveyed in China, the UK and Italy would choose a luxury mechanical watch over the latest release of a smartwatch, every year, for the next ten years. The respondents in the United States were a notable exception, however. An almost equal proportion of Millennials in the US would choose a smartwatch versus a mechanical watch. The latest data released by the Federation of the Swiss Watch Industry (FH) shows that global luxury watch sales continue to be driven mostly by younger consumers in Asia. Hong Kong (fueled by Mainland Chinese tourists) and China are driving respectively 35.7 per cent and 21.7 per cent of the yearly growth in 2018. 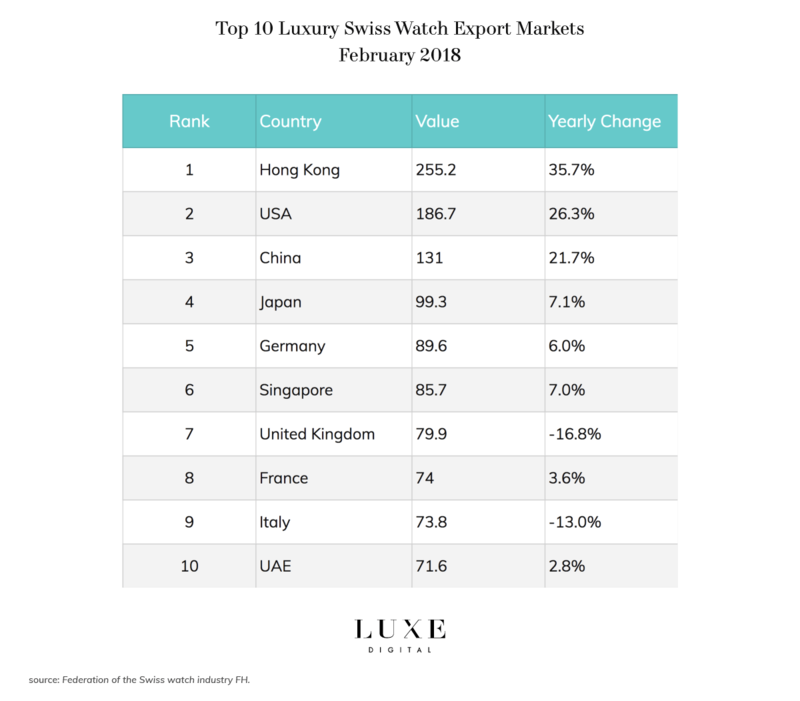 The United States, the second largest market for luxury Swiss watches after Hong Kong, also benefited from a strong 26.3 per cent growth but remains 6.6 per cent below the 2016 sales levels. The same goes for most of the other markets in the top 10 listing. It’s important to note, however, that while 2018 sees growth nearly everywhere (with the exception of the UK and Italy), the sales of high-end watches haven’t reached the pre-crisis performances of 2016. Aside from Hong Kong and China, Singapore is the only other country that enjoys a modest 4.7 per cent two-year growth. And here again, it’s mostly the overseas Chinese tourists that are driving Singapore’s growth. So while the luxury watch industry is optimistic for 2018, total sales haven’t fully recovered to their pre-crisis levels yet. The impact of the anti-corruption campaign in China can arguably still be felt through the industry. Times have been tough for the biggest names in the luxury watch industry. While the high-end mechanical watch brands saw their sales increase in the second half of 2017 and the first half of 2018, this is in the back of two years of constant decline. Modern luxury consumers are indeed “spoilt for choice” these days. But if anything has become irrelevant, it’s the appeal for “old-school luxury” watch brands rather than the analog movements themselves. In fact, a new breed of luxury analog watch startups has been flourishing, led by Millennial entrepreneurs. In recent years, there’s been an explosion of online-driven analog watch startups founded by Gen Y. 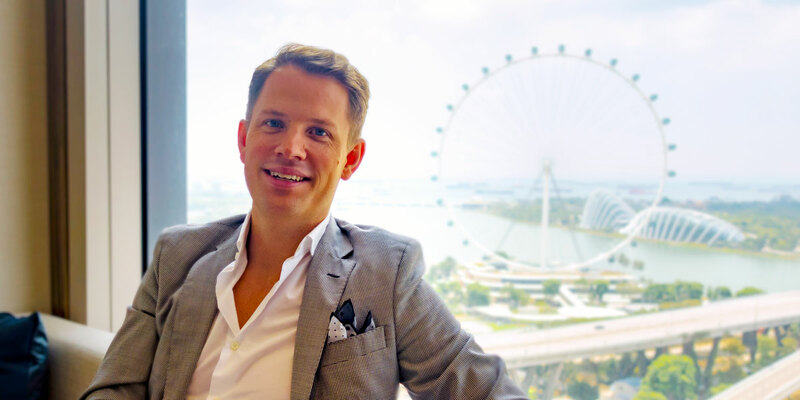 The first in the game to strike it big was Daniel Wellington, a 33-year-old entrepreneur from Sweden. The brand, sold under his name, touted a line of minimalist watches inspired by the aesthetics of Rolex and Piaget timepieces, but using quartz movements and priced under $200. By 2016, the brand had generated $200 million in revenue, selling over a million watches a year, by primarily relying on marketing through a network of Instagram influencers. 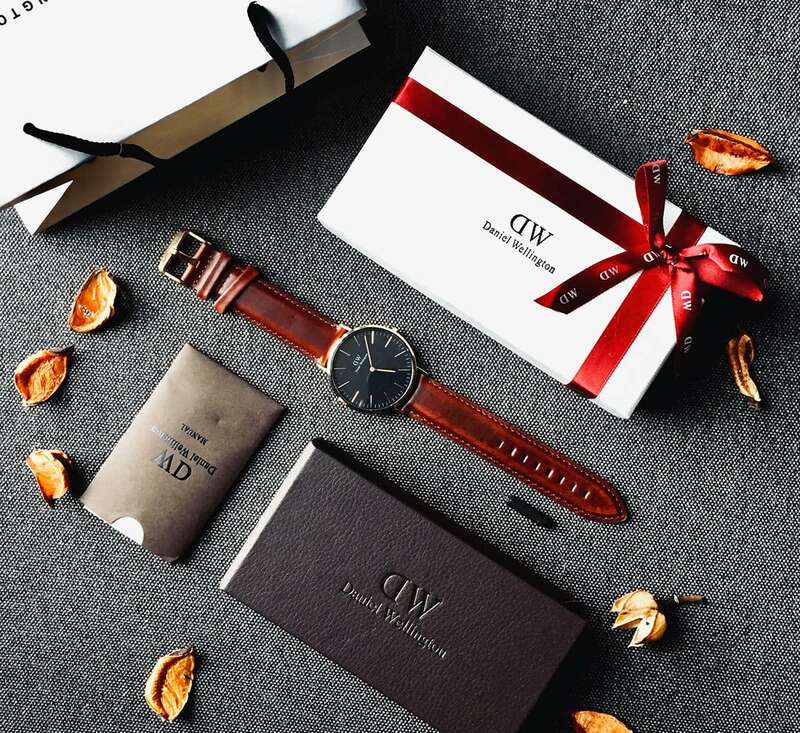 Named one of the fastest growing companies by Inc. in 2018, Daniel Wellington has become a poster child of the modern luxury watch renaissance and has inspired a slew of similar startup brands, all with a different aesthetic. It’s safe to say that there is a movement brewing behind a new class of modern luxury analog watches, but it’s merely in a language that traditional luxury watch brands have yet to understand. So, what is it that these tuned-in Millennial entrepreneurs know about marketing luxury to their generation that has resulted in success? The answer seems to revolve around simplicity, personalisation, and transparency. Affluent Millennial consumers are interested in purchasing high-end analog timepieces. But their expectations for what makes for an appealing product differs from the previous generations. The conversation usually revolves around digital innovation when it comes to Generation Y. However, as digitally-embedded as they are, Millennials are also increasingly searching for chances to unplug and enjoy simple experiences. That’s where analog watches come in. It’s a tangible reminder of simpler times. In this case, simplicity equates to checking the time without being exposed to numerous emails, texts, and social media notifications on their phone. 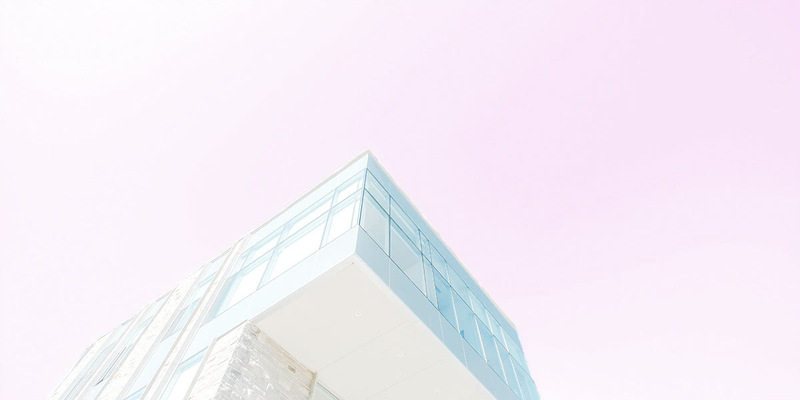 According to Jennifer Chong, a Millennial entrepreneur and co-founder of Linjer, “As entrepreneurs working day and night, we were really stressed every time we looked at our phones to check the time because there would be WhatsApp and Facebook notifications, and emails – all these things that basically become to-dos.” That’s what ultimately pushed Jennifer Chong and her co-founder to create Linjer, a minimalist watch brand that exudes clean lines and modern luxury. As many luxury watch brands now seek to integrate cutting-edge technology and digital capabilities as hero features, the rising popularity of analog watches amongst Millennials is a strong argument against over-complicating the elementary task of telling time. Modern luxury for the luxury watch industry also seems to centre around customisation, which comes as no surprise given the unique propensity of Millennials towards self-expression and individualisation. As a matter of fact, research shows that 21 percent of Millennials directly use terms such as “personalised” and “fun” to describe luxury. In comparison, only 12 percent, of baby boomers identified luxury with these adjectives. Modern luxury watch brands, like the Los Angeles-based startup MVMT, focus on marketing their luxury timepieces as versatile accessories and place more value on form instead of function — a marked departure from the Swiss-made mechanicals boasted about by traditional luxury watch brands. Marketing geared towards the desire, especially for men, to have an element of playful self-expression as a part of their business and casual attire, MVMT wristwatches embrace the stylish modern gentleman and feature minimalist, sleek design with interchangeable bands and varying colour faces. 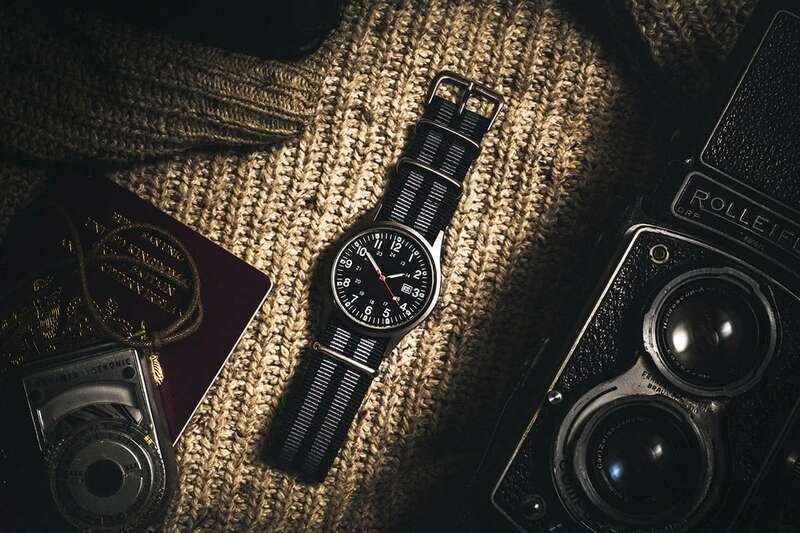 MVMT leverages Instagram to showcase its wristwatches in various adventurous backdrops and unique experiences. Instead of defining the wearer, modern luxury watches are personalised to the wearer — accompanying them in whatever lifestyle or adventure they choose. This sense of personalisation is not exclusive to young Millennial startups. High-end luxury watch brands that sell mechanical watches at a higher price point, like Nomos Glashuette, are targeting a younger generation and embracing a modern interpretation of luxury. Unlike its counterparts, Nomos does emphasize traditional craftsmanship, quality and its own distinct philosophy on watchmaking. However, the brand website and Instagram are devoid of the gravity and opulence traditionally associated with old-school luxury watches. Instead, it showcases a bright, colourful yet minimalist brand aesthetic that emphasises personalisation, adventure and a sense of fun. The formal gravity previously associated with owning a statement luxury watch seems to be less appealing to this new generation of consumers. Instead, an argument can be made that personalisation allows luxury to be a little less serious and a tad more fun. Besides nostalgia and personalisation, the level of transparency that modern luxury watches are offering is unheard of in the traditional luxury watch industry. In fact, the demand for transparency from Millennials is a driving force that we have seen impact many luxury industries, as this is a generation that never takes brands at face value and is immune to traditional forms of aspirational luxury marketing. Following the code of “gentlemanly” behaviour, Brathwait spares no detail on the cost of assembly and lists the exact dollar amount associated with each component on their website. From the leather strap and the coating to the dial and stainless steel case, consumers get simplicity, transparency, and luxury — the three central brand values for Brathwait. 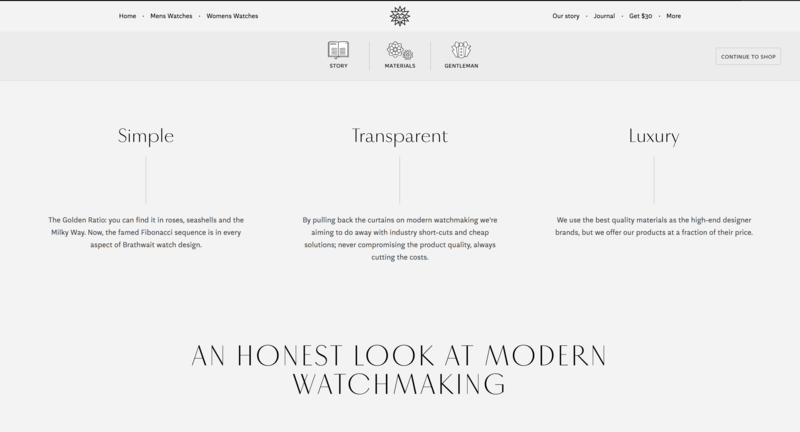 Instead of flashy, aspirational imagery, modern luxury watch brands are using their website to showcase honesty, transparency and pulling back the curtains to escape the smoke and mirrors that have traditionally been a staple of luxury watch marketing. As the broader definition of luxury changes for the Millennial generation, modern luxury watch brands have been quick to move away from “old-school” displays of luxury and opulence. Instead, modern luxury watch manufacturers have embraced digital and social channels to communicate new tenets of luxury: nostalgia, personalisation and transparency. Luxury watch marketers need to be aware of the overall re-definition of this category and subsequently, consider how to leverage digital and social platforms to redefine their own luxury watch brand to appeal to a new and savvy generation of modern luxury purveyors. 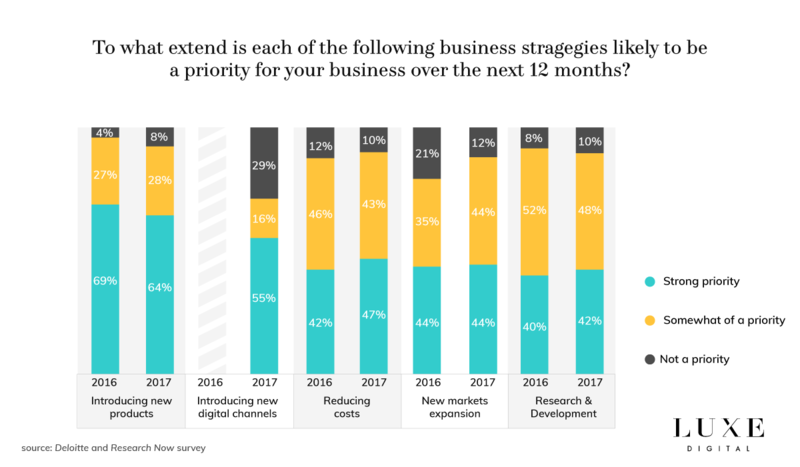 The same report from Deloitte mentioned above found that the business priorities for high-end watch manufacturers will be centred around new product launches and digital innovations in the coming years. 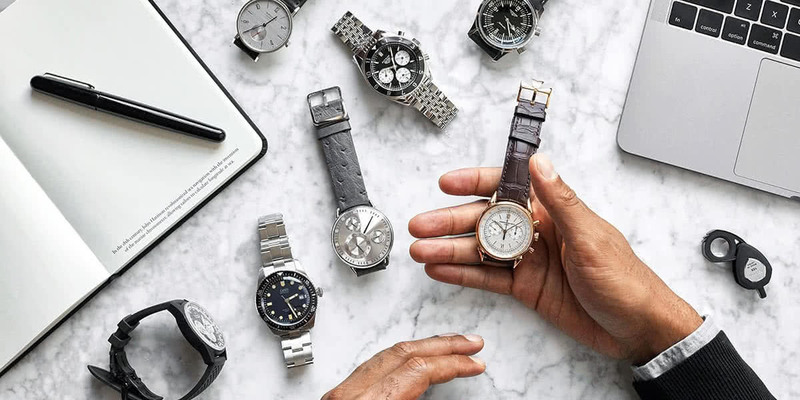 Based on an online survey of more than 60 watch executives conducted by data collection provider Research Now, Deloitte identified the strategic priorities of luxury watch manufacturers. The introduction of new products remains the single most important priority for luxury watch brands. 64 per cent of the surveyed executives considered it to be their primary objective for 2018. Timepiece design seems to be the leading element of new product launches, with 42 per cent of respondents saying that a classical style, rather than sport, will be driving luxury watch sales in 2018. The traditional luxury watch industry has plenty of historical timepieces to draw inspiration from when it comes to classical design. A number of cornerstone models celebrated their anniversary in 2017 and 2018. The Cartier Tank, for example, turned 100 last year, while the Rolex Sea-Dweller turned 50 and the Patek Philippe Aquanaut celebrated its 20th anniversary. Newcomers to the high-end mechanical Swiss watch industry, such as Montblanc, are also producing vintage-inspired models. Montblanc, who bought the rights to historical watch brand Minerva, celebrated the 160 years history of the brand with the 1858 collection. The 1858 collection was an instant hit after introducing the Geosphere, a vintage-inspired watch with a world time complication. Similarly, Tag Heuer reintroduced the Autavia, officially known as the Heuer Heritage Caliber Heuer 02, in 2017. Omega also launched its 60th-anniversary trilogy complications. To attract young affluent shoppers, traditional luxury watch brands unveiled new affordable, entry-level models. The oldest manufacturer of fine watches Vacheron Constantin, for example, launched in January 2018 its FiftySix collection, with a contemporary and historically inspired design and a more affordable price point which starts at US$11,700. Another new product development priority is the launch of more high-end analog watches for female consumers. New women watches from Richard Mille, Audemars Piguet and even IWC (which was once clearly positioned as making watches “engineered for men”) were recently released. 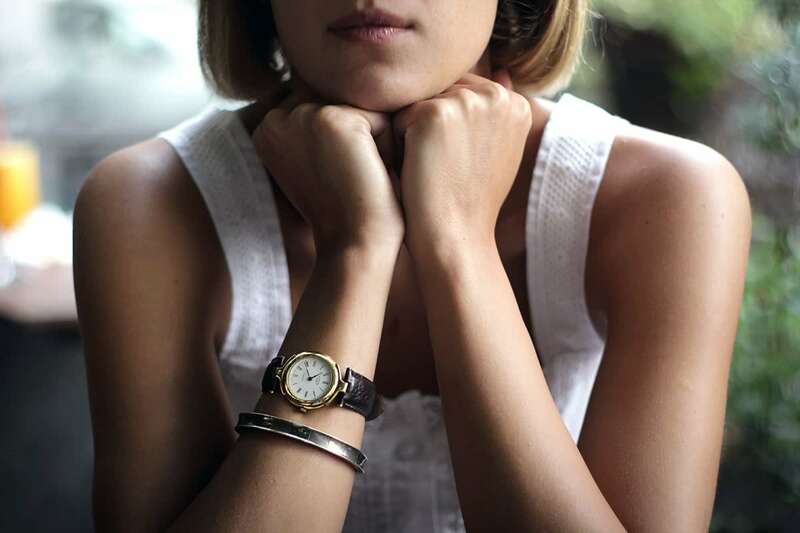 Designed and made from scratch with women in mind, these new women models are not simply smaller versions of men’s watches with decorative options. Luxury watch brands are now more sensitive to their women’ needs and growing appetite for complex mechanical watches. The second most important business priority identified in the Research Now survey is the development of new digital capabilities to answer the omnichannel expectations from affluent Millennial consumers. 55 per cent of the executives interviewed said that they would increasingly focus on building up their online sales platforms and improve their online marketing campaigns. The growing importance of digital for the high-end watch industry comes as no surprise. Our recent report on the digital transformation of the luxury retail industry already discussed the increased contribution of digital to the total global luxury sales, but also the influence of digital on purchase behaviour. Even though traditional luxury mechanical watch manufacturers have been slow to embrace digital, there is no doubt that it’s now a critical medium to embrace. Brands who fail to incorporate some elements of online engagement with their consumers will soon become irrelevant to affluent Millennials and the subsequent Generation Z shoppers. High-end watch manufacturers are experimenting with different ways to incorporate digital into their business strategy. Tag Heuer, for example, introduced in 2017 a limited edition timepiece to be sold exclusively online in the United States. In 2016, IWC was the first Swiss luxury watch company to announce a partnership with online multi-brand retailer Mr Porter. They have since been followed by other luxury brands from the Richemont Group, such as Cartier, Jaeger-LeCoultre, Piaget, and Montblanc. Interestingly, the Richemont Group announced in January 2018 its intention to purchase the YNAP Group, owner of Mr Porter and Net-A-Porter, for USD $3.44 billion. Other high-end mechanical watches are exploring partnerships with well-established online publications. This is the case, for example, with TAG Heuer, Zenith and Vacheron Constantin (also from the Richemont Group) who are among many other brands now available on the Hodinkee online store. This comes after several years of developing limited edition timepieces exclusively for the site. 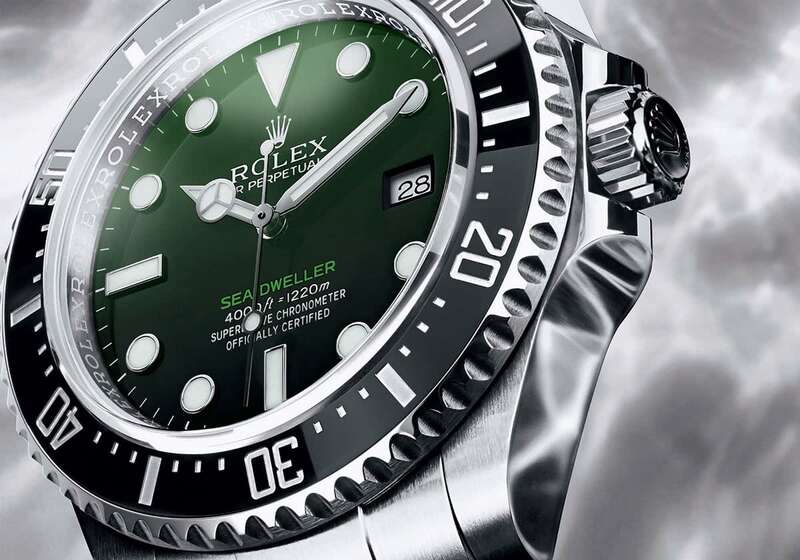 Overall, 34 per cent of the executives surveyed by Deloitte expect online sales to become the most important sales channel for luxury watches in the near future, up from 25 per cent of executives just a year earlier. As important as the online retail strategy, the digital marketing efforts of luxury watch brands will see more experiments in the next five years. 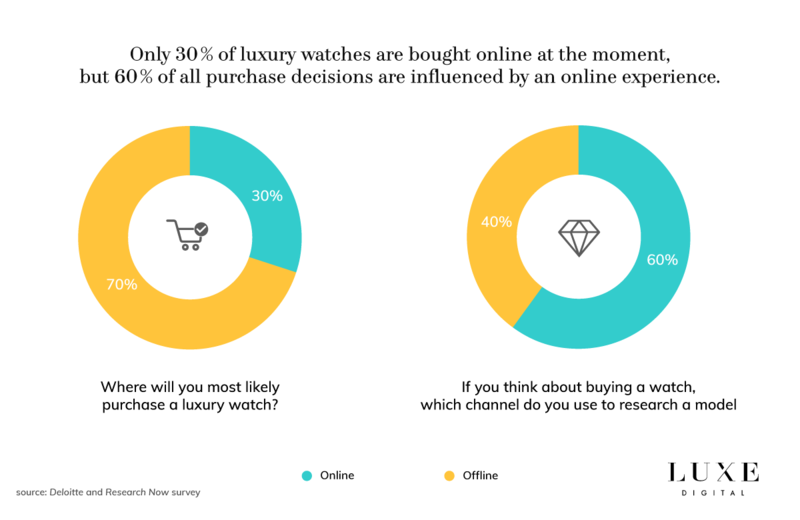 While only 30 per cent of the luxury watch buyers are likely to purchase their timepiece online, at least 60 per cent of all luxury purchases are in some way influenced by what consumers read online first. The importance of digital marketing is thus significant for watch manufacturers. Social media and influencer marketing are the two primary playing fields for high-end watch brands to experiment with digital marketing. 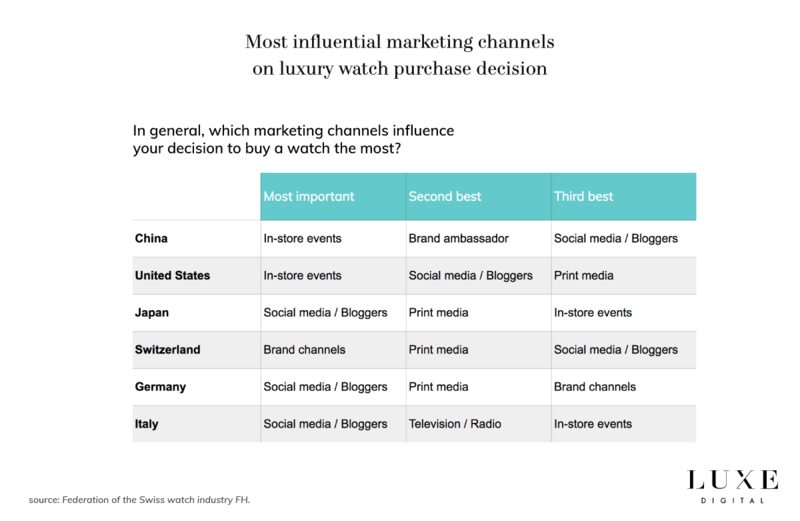 Consumer surveys from Deloitte found indeed that social media and bloggers have the greatest influence on a consumer’s decision to buy a luxury watch in three out of the six countries surveyed. Millennials use online as a tool for research, a less intimidating way to gather detailed information about watches compared to high-end boutiques. The traditional luxury watch industry is finally recognising the critical role of social media and digital marketing to win the much coveted Millennial consumers. 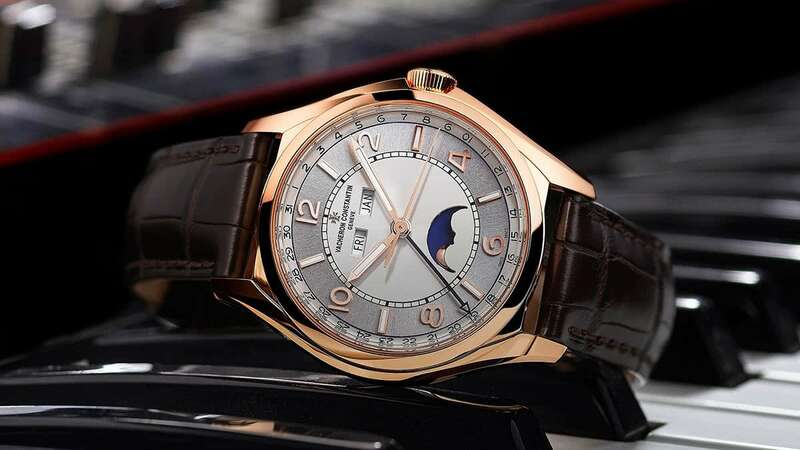 Even the über-traditional Swiss horology house Patek Philippe joined Instagram this March 2018, which proves that the luxury watchmakers are finally waking up to the potential of maintaining a digital conversation with their (future) affluent shoppers. 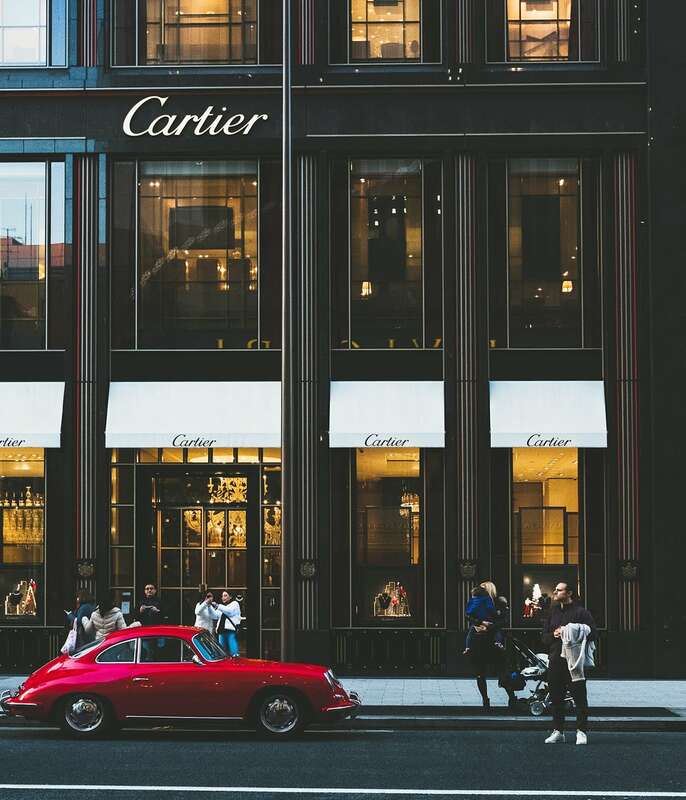 A seamless integration of online and offline marketing campaigns is the best approach for luxury watch brands to engage with their affluent Millennial consumers. The growth in online luxury goods sales is finally convincing high-end watchmakers to step up their investments in e-commerce and digital channels. If the journey to digital relevance is still long for some, winning luxury watch brands will be those who invest in strategies to reach new demographics and younger consumers online. The Deloitte Swiss Watch Industry Study 2017. It’s all about digital, Karine Szegedi, Jules Boudrand and Luc Zobrist. 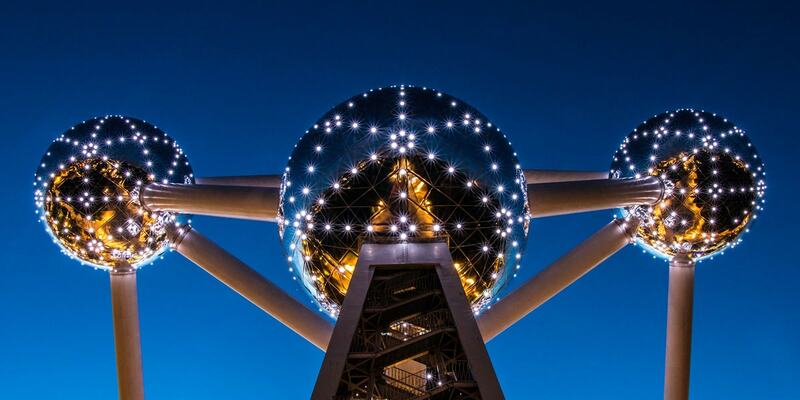 Deloitte. 2017. China corruption prosecutions drop for first time in five years, Hudson Lockett, The Financial Times, January 25, 2017. Luxury watch industry hopes worst is behind it, at last, by Ralph Atkins, The Financial Times, March 23, 2017. Daniel Wellington AB, Inc.com, 2018. The new language of luxury: how millennials are changing the shape of luxury, Ben Bolton and Lisa Quinn, February 2016.